Streaming is rapidly taking over homes, but you didn’t need me to tell you that. No matter if you have a traditional pay-TV service or not, you probably also stream. It’s just a fact of life here in 2019. But go to your favorite bar, and there’s not a streaming box to be seen. Are bars and restaurants falling behind or is there something else going on here? A lot of what you see on your TV isn’t determined by technology, but by lawyers. Contracts rule the pay-TV world, and those contracts are completely different when you’re talking about business. In a home, it’s assumed that the TV program you’re watching is for you and you alone. In a business it’s assumed that you’re making money in some way by showing that TV program. For example, TVs in a bar encourage customers to stay longer. Those contract lawyers know that businesses are making money on satellite TV and they want their piece of the action. Commercial satellite TV is priced differently depending on how many people are expected in the room. They use the “fire code occupancy” (the maximum number of people legally allowed in the room) to determine how much to charge. Rules like this won’t stop businesses from streaming, except the contracts haven’t been written yet to allow them to. It’s definitely not legal to stream unless you have an agreement from the content creator and those companies have been pretty slow to deliver. Right now there isn’t really a television provider who is offering a commercial streaming package. In fact of all the major players, it seems only Spotify is really jumping into the world of business. 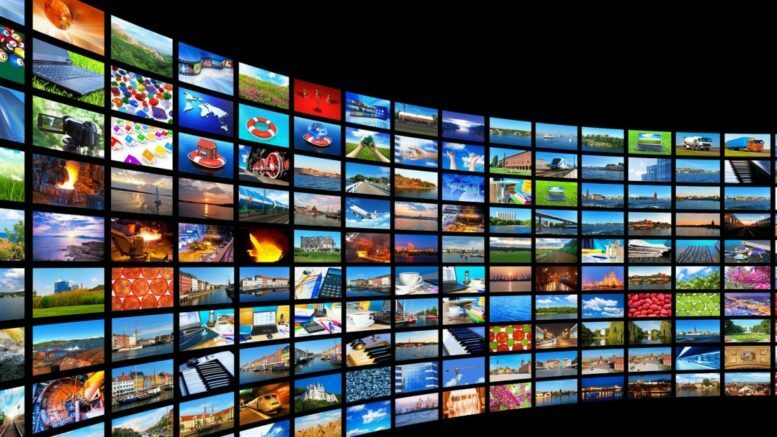 Here’s the big difference between satellite TV and streaming. If you want 25 TVs in your bar and you want each to show a different game, you still only need one satellite dish. Satellite TV is a broadcast medium. What that means is that a signal goes out to everyone and it doesn’t matter at all how many people receive it. That’s the magic of traditional TV. It doesn’t take very sophisticated equipment because all you’re doing is basically plucking a signal out of the air. On the other hand, streaming is a multicast medium. You need one stream for every different channel you want to watch. That isn’t much of a problem at home, although if you have teens you probably realize that the home internet gets slow when they’re streaming. In a bar, imagine 25 high-definition streams going at the same time and that’s a recipe for trouble. Adding to all this pain and suffering is the fact that most businesses pay a lot for internet and don’t even get the same speeds you get at home. You probably get close to 100Mbps at home, at least during off-hours when no one else in the neighborhood is using the internet. Businesses often struggle to get 50Mbps and they pay a lot more. This has to do with the fact that internet companies make the most money when their customers are close together. Most businesses are larger and further spaced out than most homes. So when will you be able to stream in a bar or other business? It’s coming, to be sure. It’s going to take some time for the lawyers at the major streaming companies to get ahead of things. With AT&T firmly pushing Watch TV and DIRECTV NOW, and planning to launch several more streaming services this year, I have a feeling that problem will get solved soon. The problem of whether or not your average business will have the technology to stream to all the TVs it has is going to probably take a little longer to resolve. We’re seeing new fiber buildouts all the time but businesses aren’t always the top priority. Hopefully the outlook for business streaming will improve this year but I forecast it will be slow going for a little while. If you still don’t have pay TV for your business, give the experts at Signal Connect a call at 866.726.4182. They’ll set you up with reliable satellite TV that won’t clog your company’s internet. What will happen to the 119 satellite location when SD service stops in 2019? IMPORTANT: If you use a SWM32 you also need a polarity locker.